We partnered with Ann Sacks to create a museum-quality installation to serve as a centerpiece of a new retail environment. We took a craftsman’s approach, using our code like a stonemason’s chisel. Orderly — but filled with evolving color and shape — the final visual experience unfolds and evolves for the viewer across several video screens in mosaic, expressing Ann Sacks’ union of material and art with our union of development and design. Humans have been making tile and mosaics for thousands of years, and Ann Sacks makes the most beautiful tile in the world today with much love and respect for a craft that took centuries to develop. 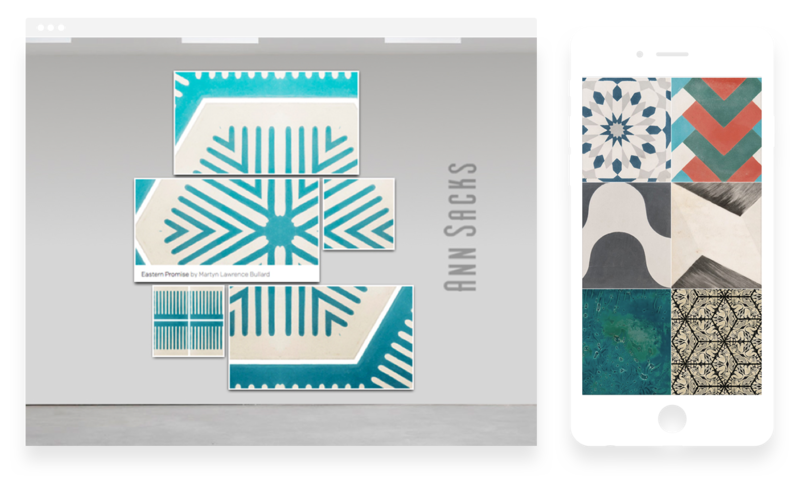 When they launched their first digital showroom, Ann Sacks brought us in as a partner to help them create a museum-quality instal­la­tion to serve as a centerpiece of a new retail environment. We designed and built the instal­la­tion using web tech­nolo­gies so that it was light, flexible and easy to update. Visu­al­iza­tions could ingest any tile pattern and turn it into art on walls in their stores.